He also said that because of the shakiness of the UPA government at the Centre had adversely affected governance at the national level, which had hit the common man very hard. The Punjab Chief Minister's comments came on a day when his party SAD came out in full support of its ally BJP's call for nationwide strike on September 20. The BJP called the strike to protest the UPA government's recent decisions, including hike in the price of subsidized diesel by Rs. 5; capping the number of subsidized LPG cylinders at six per household per year; and opening retail sector to foreign investors. 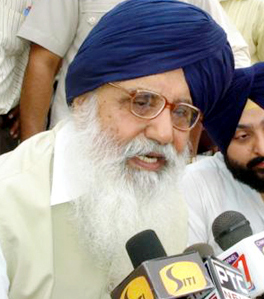 Mr. Badal termed all these decisions of the centre government as "anti-people, anti-farmers, and anti-poor." Mr. Badal criticized the UPA government's decision of opening the retail sector to foreign investors, saying the decision would hurt pretty traders and small shopkeepers.